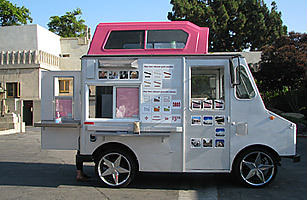 Coolhaus – Los Angeles (@coolhaus) – Food Truck Talk – Searching for the best foodtrucks! 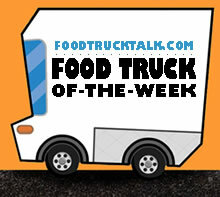 Congratulations to Coolhaus as FoodTruckTalk.com’s Food Truck Of-The-Week! Every time I go to San Francisco I treat myself to the famous ice cream sandwiches called It’s-It. They are made by sandwiching vanilla (usually) ice cream between two oatmeal cookies and then dipping them in dark chocolate. In the 70’s they could only be found in mom and pop stores. Now their distribution area is larger, but I find I only have the craving when I am in San Francisco. It’s-It started me out on a path to find the very best ice cream sandwiches. I still like It’s-It, even if they are mass produced. But I have a new all-time favorite, it’s the ice cream sandwiches from the Coolhaus food truck. Coolhaus offers gourmet all-natural ice creams in a variety of flavors ranging from traditional (vanilla, strawberry) to extravagent ice cream flavors like balsamic fig/mascarpone, carrot cake, bananas foster, cabernet, green tea, coffee toffee, brown butter with candied bacon and many more. Any of the available ice cream flavors can be sandwiched between two chocolate, chocolate chip, apple fritter, peanut butter banana, oatmeal, ginger molasses, snickerdoodle or brioche cookies. Between the great ice cream and cookie flavors you can let your creativity run rampant with an unbelievable combination of tastes! And the greatness doesn’t stop there. Each Coolhaus ice cream sandwich is then wrapped in an edible wrapper that has been printed with edible ink. Coolhaus owners Natasha and Freya take pride in their Coolhaus creation and provide a high quality, gourmet artisan ice cream sandwich that bursts with flavor and creativity. 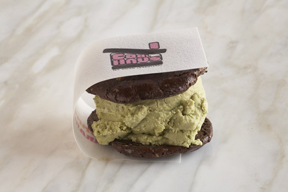 Coolhaus ice cream sandwiches are also available in Austin, TX and coming soon to New York City / Long Island.